Love Art Sushi was welcomed to Fenway with much enthusiasm on Saturday. Bostonians were lining up at 10:30 a.m., waiting for a chance to win free food at the grand opening, and by 12 p.m. the line went around the block. Earlier that morning, an intimate ribbon-cutting ceremony took place, to officially signify the opening of the restaurant. Co-owner Jessica Chiep, expressed her excitement to open a spot in Boston. Love Art Sushi’s experience contributes to a growing obsession with sushi bowls, said Ronald Liu, co-owner of Love Art Sushi. But their food can be difficult to categorize, he said. The decor promoted the idea of being at home. It was chic with the metallic accents, but also homey, with natural wooden paneling around the counter. Pops of green in the form of plants created for a relaxing and comfortable vibe. Next to the ample seating, a small green couch welcomed food coma-induced eaters and casual conversation. They also offered free Wi-Fi, a huge plus for college students and Boston residents. The staff was also welcoming and proud to share their creations. The bubble teas ranged from unique flavors such as lychee cucumber and strawberry basil agua fresca, to classics such as taro. But the true star of the show, the bubbles, were not your average tapioca pearls. The bubbles came in many different flavors and instead of the chewy texture of tapioca, they actually popped in your mouth. After breaking the exterior of the bubble, juices would explode in your mouth and mix with the tea to create a flavor that cannot be replicated. The bubble flavors included strawberry pop, kiwi pop and lychee pop. If those don’t seem appealing, strawberry jellies in the shape of a heart and mango star jellies were also an option. The food was diverse and varied. There were so many options to choose from that it could be overwhelming. But it is definitely good news for any vegans and vegetarians. This restaurant is perfect to customize to your taste and dietary restrictions. 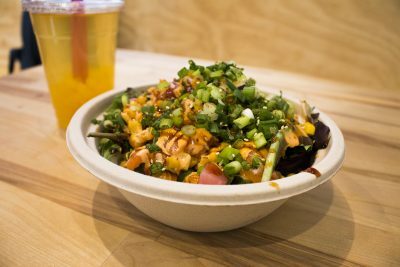 There’s also the option of choosing from any of the house-made bowls, all strategically choreographed to maximize flavor. Most fill up a large bowl with whatever their heart desires — a base of sushi rice, or an endless amount of any mix-ins including salad, zucchini noodles, corn, beets, sprouts, ginger, shiitake mushrooms, edamame, roasted garlic and more. Top it off with fish such as fresh salmon, spicy tuna or poke, but for vegetarians or vegans, they also have hard-boiled eggs, ripe avocado and other options. A variety of eight different dressings and sauces tied the whole dish together. Among classic sauces like Gochujang and sweet chili, the Avoverde was a surprising, delicious addition. Even the desserts were unique. An eat-in restaurant with such fast service offering slices of fresh crepe cakes is unheard of. The matcha cake is made up of countless layers of bright green crepes separated by a thin layer of cream was mesmerizing to look at. Its subtlety made it even more delicious. It exhibited the perfect amount of sweetness, and though it was full of flavor, it was light. For the quick service, Love Art Sushi does not skimp on quality or quantity. The food is not only fresh, but flavorful, and for fast food, it’s quite healthy as well. Not to mention, it’s built in a way that is aesthetically pleasing and perfect for all our soon-to-be-Instagram posts.